by Gloria Whelan 32 pp. Hardcover. 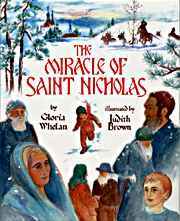 A simply told story with colorful and sweet illustrations of a young contemporary Russian boy whose faith works a miracle to open a church in his village dedicated to St. Nicholas that had been closed sixty years before during the Communist regime.